New BCC ads on MANS. Vodaphone side ads on just about at least one of every fleet type. Quest care advertisement on some gassies. Very old Light rail jobs promotion ad on 344,345,346 and many more. Flick pesticides now on 351 and belco mans. Go for the congo advertisement on irisbuses and gassies. 334, 356 & 356 now features an advert for Canberra Outlet Centre. List last updated 16 September . Bus 572 features an ad for... Something red?? And a couple of stags also advertise a nursing home too. One and the same. But for St Basil's Home Care instead. It is on at least 572, 571, 553, some STAG's and at least one MAN diesel. Note that 406 has received a new full side ad and back ad both for Campbell C5. You sure 406 isn't an AOA as per 360? It wasn't when I walked past it, one side was ad free, the others had C5 all over it, but an honest thought was that it was a half baked job and the bus had to leave for its next run from the depot before they had finished the AOA.... Well not really AOA at the moment. Should've been pretty easy to tell - did the nearside ad cover the entire side of the bus, or did it cover from after the front doors to almost the rear? 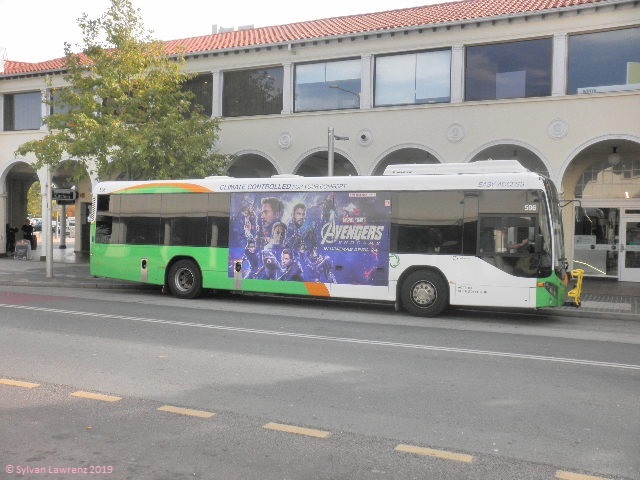 I've seen buses go out with half an ad before, so it could be possible that it was an unfinished AOA I guess. When was this? (Day / time not mentioned) Very possible AOA will be completed today. Yesterday at about 4:10 pm in the city. Was going to take a few shots but the bus left before I could. Covered the entire bus... but the other side of the bus was blank. Differently styled Quest Care ad. Origen energy are now advertising on a few new scanias (side ads) with Oporto a small side advert too. I've seen it in some MAN before - it looked no different to any other inside-bus advert though. Same thing has appeared in 380. I think it works well, and would like to see the Fare stickers are applied on the window next time around (in the "green buses" anyway - the Renaults should continue where they are). Can I ask, what does AOA stand for? i understand it's to do with the ads, but i can't find the definition anywhere. What does AOA stand for? I understand it means All Over Advertisement. On the subject of 390 and stickers, why was it that 374 never received any? Quick!! Someone get a photo of 948's ad before it disappears! Things is though, Oporto and McDonald's have paid for a contract on the buses so they will be ripped off if they get taken off before the due date. Extra ad-on: The news about the new advertising laws reveals the fact that the promotion of fossil fuels will no longer be allowed as adverts on buses either. But I believe that 963, 967 and 971's taking action liveries will be safe because they encourage fossil fuels to be conserved. There is now a new Scania which has a right hand side advertisement for STAR WARS. I wonder what will happen to the Gaspods which have ACTEWAGL stickers. They don't directly advertise fossil fuels, but ACTEWAGL are a gas and electrics company. Not actually FOR Star Wars - it's a Bags to Go ad. I assume there's a Star Wars range of baggage. A Scania L94UB now has a side ad for Access Canberra & mentions something about transport. As per the Canberra Times, the Unions Light Rail ad's have been removed. The majority of BCC ads are gone from the Renaults. Either the ban doesn't apply yet or else Zambrero and Subway are not regarded as "junk food", since new ads for both are appearing. A number of new "Duncan's Plumbing" rear ads have appeared on Euro VI Scania's and I think I saw one on an artic or two. 565 is the only bus I remember specifically though. What's that one that's on buses 591 and 586 I think that's talking about a bus? I keep seeing them, but I'm unable to read them quickly enough to know what it says xD anyone got a still shot of one? "Harry [picture of a dog] loves gardens"
While (at last sighting) the ad on 442 remains unchanged, there is a new side ad on 318 which has both "Harry Loves Gardens" and Willow Park Nursery. So there's your answer, finally. ...........since 511's may soon disappear. I wonder if Southern Cross Nine could include 9 shows in the a new AOA? The Block goes sideways, let us hear your VVVVOOOOIIICCCEE, or watch NRL 5 nights a week on Channel **. So Cadbury chocolate isn't considered as junk food? Only seen it on a few Irisbuses, but likely to appear elsewhere. They're advertising Cadbury Oreo Chocolate and I think that's an interesting combination. And the Cadbury ads have promptly been removed. The Brindabella Christian College window and rear ads have returned to selected Renaults. Traversing the advertising tender, food items designated as "Red" on the ACT Vending machine policy aren't permitted to be advertised on buses. Allhomes.com.au have hit back in the advertising war. They've now got AdShels and are rolling out both large and small side ads on buses. No new AOAs though. Yet. Go Transit have been awarded the new advertising contract for the following 3 years. Nothing really new in the contract, except this time 20 buses must be kept clean. Plus City Loop & trial buses are to remain ad free. In other news, a new ad for 104.7 is coming this year. 944 has a rear ad below the window for Go Transit advertising, the first non-BCC ad on a Renault for quite some time (a green that is absolutely revolting on the orange livery).